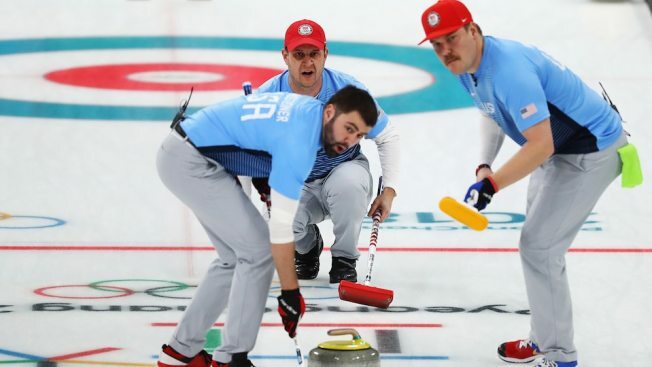 Matt Hamilton, John Shuster, John Landsteiner of USA compete in the Curling Men's Semi-final against Canada on day thirteen of the PyeongChang 2018 Winter Olympic Games at Gangneung Curling Centre. The Winter Olympics is synonymous with skating, snowboarding and…curling? This year, the U.S. men’s curling team managed to shock the world by sneaking up from behind and winning the gold for the very first time, causing quite the upset for Sweden. Needless to say, curling caused a buzz in the states. The sport never fails to peek viewer’s interest. After the broadcast of the Olympics, local curling clubs often see an increase in business. According to reports, the number of U.S. curling clubs registered with the national organization USA Curling has nearly doubled, from 99 to 185 since 2000. Plainfield Curling Club in South Plainfield, New Jersey, is the only dedicated curling club in the state. It is a not-for-profit organization owned by members and operated by volunteers. Curling season for the club runs from October to April with nine weeknight and weekend leagues for members. Those who are interested in giving curling a try can normally attend the Curling Experience, a two-hour session where patrons can learn the basics of delivery and sweeping and play a short game. Their website warns those who are interested for the Curling Experience events that all slots are all sold out through April. There are however always opportunities to become a member and join. Ed Veltre is the president of the Plainfield Curling Club. He says that with the Olympics, there is always a peek because of the television coverage. Veltre says that it does lull during the off years, but the club tries to maintain an even flow of curlers.